With fewer and fewer children donning costumes and hitting the streets every year to celebrate all things sweet and spooky, the Halloween tradition is alive and well in the virtual worlds of today's massively multiplayer online games. The world's a scarier place than it was when I was a kid. Back in my day parents had no qualms about suiting their children up in dark clothing and sending them out to play in traffic and eat candy. It's not so much that the world has gotten more dangerous as it is our enhanced ability to perceive the dangers that were already there. With the internet and cable television we get to see all the horrible things that have been happening for years, and it scares the hell out of parents and children. Communities just aren't what they were back in the day, unless you count online communities. In the realms of games like World of Warcraft and EverQuest, children of all ages can celebrate the season without fear, outfitting their characters in crazy costumes, earning rare in-games items, and taking down creepy crawlers of all shapes and sizes, all safely from within the confines of their own computer desk. They may get killed, but it's never permanent. Let's take a worry-free look at how the major massively multiplayer games are celebrating Halloween this year. 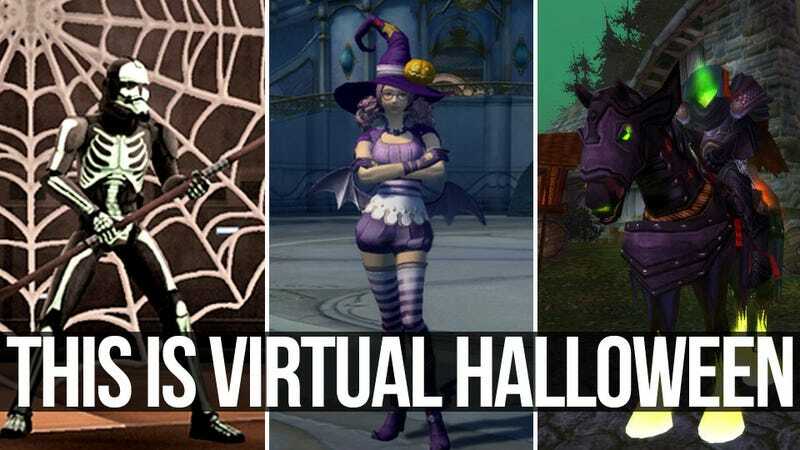 Go on, click through the gallery to see how MMO developers are getting their spooky on this year, and don't get too upset if I missed your favorite game; there's a comment section below this post just waiting for you to share. Halloween-themed costumes and items await in Aion's creepy Harvest Revel, with players tasked with gathering souls for a chance at fabulous prizes. They've got a full guide going on at the Aion website. The Harvest Revel runs from Wednesday, October 26th, 2011 to Wednesday, November 9th, 2011, and is a celebration of spooky fun. Last year, the Pumpkin King's plans were thwarted by a gang of cheeky Sugarcrooks, and this year old pumpkinhead is nowhere to be seen. But we're sure the witches in Sanctum and Pandaemonium can have nothing to do with that. And we're equally sure that they have only the best, most noble reasons for having you collect souls on their behalf. Paragon Studios pads their usual Halloween fare with Dr. Kane's House of Horror, giving the heroes and villains of Paragon City a chance to quash a vile plan to turn innocent citizens into slavering zombies. Dr. Kane's House of Horror will add even more panache to the existing Zombie Apocalypse and Deadly Apocalypse, as you venture into a nightmarish mansion full of danger! Take on the Dr's Zombie horde as you make your way through this terrifying house of horror, will you be able to stop the Dr from creating a Zombie army? It wouldn't be a Halloween in the DC Universe without Scarecrow making an appearance. It'll take four players to take down this special incarnation of Batman's scariest villain, with special seasonal treats available to those that survive his diabolical tricks. You've got until November 7. Fly into DCUO's frightfully fun Halloween event to defeat the scariest Bosses and earn in-game tricks and treats! All players will be auto-granted a new mission to enter the Gotham City Sewers and defeat Scarecrow, a Group Boss Fight for four players of any level. Take down the fearsome villain for a chance to earn wicked rewards, including rare loot and Spooky Tokens, which can be used to purchase ghoulish items in Skeets' Boo-tique. The Boo-tique is haunted with Halloween items such as the Jute shirt or pants (chillingly reminiscent of the Scarecrow's own) or a Pumpkin Head. For players who prefer pets, DCUO has terror-ific pumpkin companions that come ready to fight alongside them in combat! Plus, players can also receive Spooktacular loot by visiting the Vault or defeating any boss in the game. This Halloween the most spine-tingling events are happening in DC Universe Online. Find out if you have what it takes to beat DCUO's Spooktacular Scarecrow - hahahahahaha! The massively-multiplayer online role-playing game that refuses to die (if only the sequel had been better) has been celebrating Halloween since the early days. I remember spending the entire holiday running from zone to zone, collecting special rare items from invading monsters. Sounds like they've toned things down a bit as the game's matured, but the holiday continues to get its EQ due. The party ends tonight! Dive into a spooky quest to earn tricks and treats in the marketplace for FREE! Players are dared to log in and earn tricks such as the Jack-O-Lantern of Plenty, summoning throw-able pumpkins that can be launched at others, and treats such as the Aura of Jack, allowing players to be surrounded in floating Jack-O-Lanterns. This Halloween, EverQuest is truly taking Fright Night to frightfully fun levels! All you have to do to earn special holiday-themed loot in EverQuest II is log into the game. That's it, just log in, get your stiff, and go back to the original game. Celebrate EverQuest II's Nights of the Dead event with by trick-or-treating in certain zones in-game. Players can show off their costume illusions while taking part in Halloween-themed quests. Additionally, EverQuest II players will find no shortage of spooky surprises during the SOE Trick-or-Treat event, October 28-31, when Halloween themed loot will be delivered to them via in-game mail for logging in. It might be a game for kids, but they sure know how to throw a family-friendly Halloween party in Free Realms. What other game gives players a vampire versus werewolf dance-off? Extra points for using the word "spooktacular". Jump into the Free Realms Super Spooktacular in-game event for Halloween fun and adventure! Spooky quests, a Vampire vs. Werewolf Dance-Off in Bone Bog Cemetery, a new Werewolf mount available for purchase in the marketplace to haunt in style and new costumes including a Ghost, Grim Reaper, Mummy and more are available for players. Also, players will be able to claim fun tricks and treats for logging in during the SOE Trick-or-Treat event, October 28-31. In what will (hopefully) be the last Halloween for Guild Wars before Guild Wars 2 comes out, Mad King Thorn and his associates rise once more to spread terror and goodies throughout the land. Once a year, Mad King Thorn and his spooky cohort visit the land of mortals for a creepy celebration full of holiday quests, the Costume Brawl PvP event, Halloween-themed guild vs. guild battles, two new costumes, and lots of other tricks and treats! Not even futuristic massively multiplayer shooters are free from the Halloween spirit, as the Haunted Recusrive Colony returns to menace Hi-Rez Studio's Global Agenda. The Haunted Recursive Colony is once again upon us! Doom Commander and his minions are bringing terror to the Oasis Checkpoint to satisfy their hunger for souls! Only the Agents of Dome City can save the world from the clutches of this evil horde! Level 30 Agents must protect the cage of souls at all costs from Tuesday, October 18th through Monday, October 31st. Collect special Halloween flair as you fight off the horde, and successfully complete this Defense Raid for a guaranteed reward! To help overcome Doom Commander, look out for some other orange names appearing throughout the event to fight alongside you! In NCsoft's Lineage II they're just handing out the goodies. · A wrapped pack containing a 30-day Pumpkin Transformation Stick, which turns you into a Pumpkin Ghost and can be used for 30 days. · A jack o'lantern mask two-slot head accessory that last 7 days, giving a buff that increases Max HP, Max MP, Max CP, P. Def, M. Def and Speed for one hour. And then Batman and Robin show up in RIFT. I have no idea. The day-to-day experience for the average Telaran is generally pretty spooky. At any moment a tear in the very fabric of reality could turn a picturesque Freemarch meadow into a decaying cesspit crawling with undead eager to snack on your soul. For some unknown reason things get especially twisted around this time of year, but the residents of Telara can rest easy knowing that a pair of particularly dynamic Ascended can always be counted on to keep Telara's gallery of rogues in check. While Star Wars Galaxies dies a slow and painful death, over in the family-friendly Clone Wars Adventures they'll be dancing on Galaxies' grave all night long! Everybody's dressing up, even the droids. Join the most ghoulish event in the Galaxy as Clone Wars Adventures™ celebrates Halloween. Now through Nov. 11, 2011, there are spooky costumes, devilish Droids and deadly decorations available for players to alter their characters' appearance and the appearance of their homes. As a special treat, a Creepy Crate will grant a mask each day to anyone brave enough to approach it in the Lounge of the Jedi Temple from October 24 to October 31! Jedi Members can also collect a second set of masks! For those who want more frightful fun, a special Fright Flight Halloween-themed stage of the Rocket Rescue mini-game will also be available! Also during the SOE Trick-or-Treat event, October 28-31, players can find fun illusions in-game to deck out their characters. Blizzard's annual festival of Hallow's End is in full swing, with new rewards and quests joining old rewards and quest in a spooky celebration that ends *checks watch* tonight at midnight. Better hurry. To get into the spirit of the holiday, players can visit the Wickerman celebration just outside the city gates of Undercity and Stormwind to obtain quests. One quest tasks players with lighting their faction's Wickerman (earning a nice buff for doing so), or to travel to the opposing faction's city to put a damper on the holiday by dousing their Wickerman! The Hallow's End celebration is a favorite time for many children in Azeroth, and heroes can make sure that their faction's orphans aren't left out of the fun. Jesper and Spoops, orphaned children of the Horde and Alliance, will be attending the Wickerman celebration. Players who want to make the orphans' holiday a little more special can perform quests which will make sure that this is a Hallow's End the kids won't soon forget! Complete these quests and you'll come away with a handful of Tricky Treats — once consumable candy, these sugary delights now act as a new currency which you can earn in a variety of ways over the course of Hallow's End, and which you can spend on special holiday rewards! That's not the only way to earn Tricky Treats though. If dousing Wickermen and corralling orphans isn't enough chaos for you, you can perpetrate some stench from above with the help of your faction's disgruntled senior citizens. Crones and Hags are willing to fly you over the opposite faction's Hallow's End celebrations to drop a smelly surprise on their heads — in the form of stink bombs. Naturally, the denizens of those cities won't take such an outrage lying down, so players can volunteer to help clean up the mess. Long a staple of Hallow's End are the colorful orange candy buckets that can be found in capital cities throughout Azeroth and beyond. Reach in and grab a handful of candy which can contain Tricky Treats and more — but beware! Sometimes you'll get a trick as well as a treat. The Headless Horseman's shade returns! His fiendish laughter will ring out over the countryside as he descends to set fire to Brill and Goldshire. Valiant and civic-minded players can acquire quests to put out the fires that he so delights in setting, earning some Tricky Treats in the process. Higher-level players can use the Dungeon Finder to queue up and face the Headless Horseman directly in an effort to win macabre prizes from his corpse and finally put him to rest… for now! Unlike previous Hallow's End celebrations where many rewards were earned in a somewhat random fashion, starting this year, players will be able to visit special vendors at their city's Hallow's End quest hub. There, players can spend their Tricky Treats to purchase the rewards they want most, including such in-demand items as the Sinister Squashling. So get out there to quest and Trick or Treat, because your rewards await, but don't delay. The holiday ends at 11:59 p.m. on October 31.